The world has kept a close eye on the National Rifle Association since the Parkland, Florida school shooting just 10 days ago. Students, teachers, political leaders, and celebrities are all taking a stand against the pro-gun organization. And over the last couple of days, gun control activists have started using the hashtag #StopNRAmazon to urge Amazon to pull the plug on NRATV, the organization’s 24/7 streaming channel. At the moment, NRATV can be watched via Amazon Fire, Apple TV, Google’s Chromecast, and Roku, as well as the NRA’s own website. Hollywood celebrities including Alyssa Milano, Law & Order: SVU executive producer Warren Leight, Ally Walker, Tara Strong, Amy Hargreaves, Misha Collins, and Evan Handler are among the high-profile figures using Twitter to push Amazon to sever ties with the NRA. 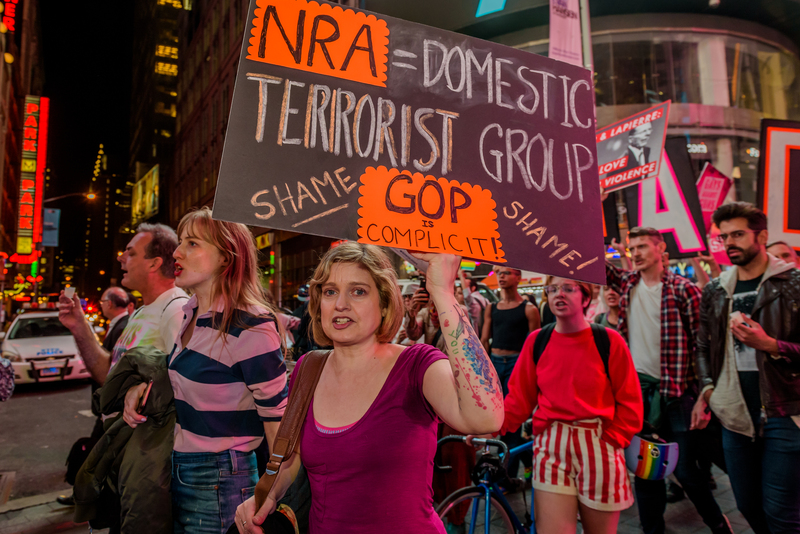 "The only way to really begin to chip away at the power that the NRA holds over our country, and perhaps even our democracy, is to begin to almost shame companies that are in partnership with the NRA." The NRA is facing increased pressure from gun control advocates in the wake of the Parkland tragedy. Fourteen students and three teachers were killed in the mass shooting, with many more injured. Parkland survivors have emerged as leaders in the gun control movement, participating in a CNN town hall, speaking with President Donald Trump, delivering speeches at rallies, and organizing the March For Our Lives march on Washington. Boycotting the NRA — and companies that partner with it, like Amazon — is just one piece of the overall movement to finally create change where gun violence is concerned. Some Twitter users are even threatening to cancel their Amazon Prime subscriptions if the e-commerce giant does not heed their demands. We're not joking. This isn't Breitbart. People are dying. Pull your NRA contracts or we #BoycottAmazon until you #BoycottNRA. Use @Wayfair works just as well. A petition calling for Amazon to stop streaming NRATV has collected close to 70,000 signatures as of this post’s publication. Consider signing your name or using #StopNRAmazon and #BoycottNRA on Twitter to share where you stand. Together, we can make our voices heard.